Haden Boardman explores the world of the Leak Stereo 20 valve amplifier. Along with the Rogers Cadet MkII and the Quad II, there can be no other valve amplifier as popular in the 1960s as the Leak Stereo 20. 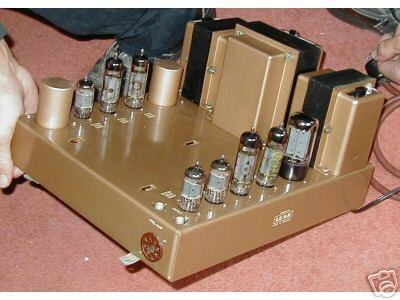 Introduced in 1958, the Stereo 20 used the same basic circuits as all of Harold Leak’s ‘Point One’ power amplifiers. The first of these was the classic mono TL12 Point One, the second an economy version, the TL10, which could only lay claim to ‘Point One’ percent distortion up to five watts rather than its full output. There was also a ‘Public Address’ TL25A, although this wasn’t a member of the ‘Point One’ family. At the end of the 1950s, Leak redesigned the range and added to it. There was the TL12+ with its EL84s, the TL25+ with the larger EL34s, and the most powerful of the three, the TL50+ which used a pair of KT88s. No prizes for guessing the output power of each! The sad thing is, the bigger they get, the worse they sound. The TL12+ is the best of the bunch, the í50 the worst by far. As for the TL25+, it has the same basic output transformer as the TL12 and sounds hardly any more powerful. 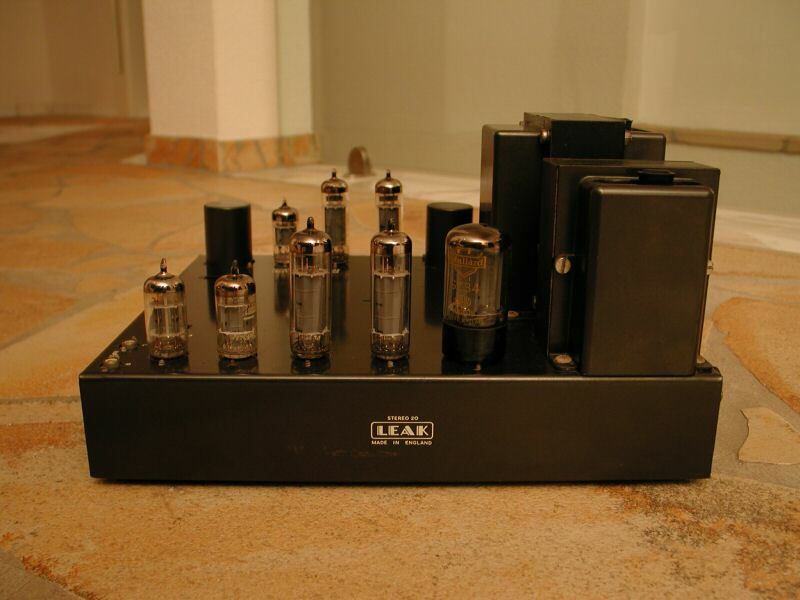 At the same time in 1958, Leak launched two stereo amplifier chassis, the Stereo 20 (EL84) and the Stereo 50 (EL34). The same sonic rule applies here – the smaller í20 floors the larger í50 and is far more reliable to boot. 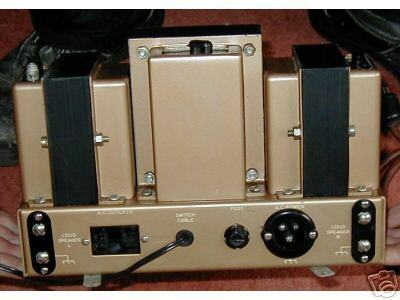 In the Sixties, Leak revamped the Stereo 50 and turned it into a Stereo 60, which is even less reliable and uses strange dual wire-wound resistors which are impossible to obtain these days. (The same items can be found on the TL50+ and some TL25s). The later models are finished in a Charcoal gray and date from roughly the same period in the mid-1960s as the Garrard 401. These stereo amplifiers had pretty much the same circuit as the mono-blocs but used ECC83s throughout the driver stages where the mono-blocs used EF86s and ECC81s. Out of the entire range, in standard form, the Stereo 20 has the best sound, followed by the TL12+. There are a couple of potential problems in the Stereo 20 – the mains transformer is a little marginal although it’s fine in normal operation, and, as was usual for the time, the input sensitivity is very high at 100mV for 10watts output. On the whole however, the Stereo 20 is an excellent design well executed. In standard, untouched form, the í20 is very sweet. The midrange is quite lucid while bass and treble are a little rolled off, but then that’s all part of the ‘vintage’ experience. More to its credit is the way the amp reveals those little instrumental and vocal details that make all the difference. In comparison to a new, modern amp of about £500 though, the Stereo 20 is amazing. The solid-state competitor obviously has more power and will play much louder but, like most valve amplifiers, the í20 has a real musical heart. Unfortunately, that’s something that most transistor amplifiers, regardless of price, just donít possess. A few words of warning on the service side. The mains transformer, as mentioned earlier, can be problematic. If you’re thinking of purchasing a Stereo 20, check the underside for large amounts of wax which may have run out of the transformer if it’s been overheating. More importantly, check the 100ohm, three-watt safety resistor (normally green in color) is still fitted at the base of the board near the transformers. As the amplifier ages, old EL84 valves pass more current than the 48mA specified and coupling capacitors will become leaky electrically with age, which means the output valves will pull even more current. It is extremely likely the main electrolytic reservoir capacitors will be leaky too. With the three-watt resistor fitted and the amplifier operating normally (ie, capacitors and valves in good condition), this resistor dissipates two-and-a-half watts and therefore runs pretty hot. Do not be tempted to change it – it is supposed to run hot. If a coupling capacitor fails and puts a positive voltage onto the control grid of the output valve, it will pass more current and may eventually go virtual short circuit. The resistor will then get extremely hot, and, if fitted correctly, will de-solder itself from the board, thus protecting the mains transformer from damage. If you are running a Stereo 20 with a higher wattage resistor fitted here, then get it changed to a three-watt one pronto. The number of barbecued mains transformers I have seen because some so-called engineer has fitted a larger resistor here rather than curing the actual fault is depressing. The quality of the passive components in the Stereo 20 wasn’t great but they do sound nice. Those that invariably need to go are the coupling capacitors, the output valve cathode resistors (use 270ohm at two-watts), the output valve cathode resistor bypass capacitors and the two electrolytic ‘can’ capacitors.These last two can be troublesome – there’s a lot of ancient ‘new old stock’ floating around, most of which is probably worse than what you’re trying to replace! An easier option is to buy tiny switch-mode power supply capacitors (47uF, 400V) and mount them on the base of the old capacitor. To do this, leave the earth tag on the can connected and then cut off the two positive terminals. The earth tag anchors the new caps which can be secured in position with a dab of silicon adhesive. To be honest, unless you have a totally mint, original amplifier, the best idea is to strip and rebuild it completely – just remember that three-watt 100ohm resistor. Caution should be exercised when it comes to the GZ34 rectifier as well. Never replace this with solid-state diodes – their performance from an audio point of view is inferior and they stress the mains transformer heavily. Leak’s power amps may be great at their best but the same can’t be said of the matching pre-amplifiers, the Point One and the Varislope. They might suffice as a stop-gap to partner CD players, but they are members of that select breed of British pre-amps that have an output signal substantially smaller than the line-level input. To top that, the phono stage is poor and the controls are noisy. The best thing you could say about the earlier versions is that they look nice. But the main thing is the great sound of the Stereo 20. The quality of its output transformers was impressive, and due to this the performance considering its price in standard form is excellent. Pay about £200 for an un-modded Stereo 20, less for a non-mint example and up to about £350 for a fully rebuilt and modified version. 3. If any resistors have changed in value, replace them. My Leak Stereo 20 has been working well since 1980, driving a set of 70s Pioneer and Goodmans speakers, giving a superb quality sound. The 20 Watts output of this amp compares with a 50 Watt transistorized Technics amp, and it definitely sounds better!